USO tour veterans/South African rock band Seether visits and performs a series of USO shows for military personnel and their families stationed in Italy and Turkey March 18-26, 2012. Multi-platinum rock band Seether visits with troops at Aviano Air Force Base in Italy as part of week-long USO tour March 23, 2012. 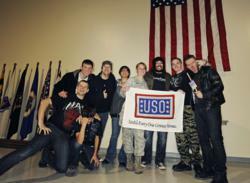 Twitter Pitch: @Seetheroffical rocks out with troops and military families on @the_USO tour to Italy and Turkey. See pix, http://bit.ly/yc9AJ8! Rockers Shaun Morgan, Dale Stewart and John Humphrey of Seether recently found time to boost troop morale and deliver smiles to military families on USO/Armed Forces Entertainment tour to Italy and Turkey despite grueling tour schedule. Having broken away from the Time of My Life Tour with 3 Doors Down to participate in their third USO tour, the USO tour veterans extended America’s gratitude and spread cheer. In all, the multi-platinum rock band visited and entertained more than 1,000 airman, soldiers and their families stationed at Incirlik Air Base, Aviano Air Base and Camp Darby. Forever changed by the service men and women they met during their first USO tour to Japan in 2009, Seether traveled to Hawaii and Guam in December 2010. In all, the band has lifted the spirits of more than 8,500 Marines, soldiers, sailors, airmen, Coast Guardsmen and reservists. Formed in 1999, Seether released their fifth studio album “Holding on to Strings Better Left to Fray” in May 2011. The album reached No. 2 on the Billboard 200 Charts and Seether went on to be named No. 1 Active and Heritage Rock Artist of 2011 by Billboard. Touring throughout North American for the past five months, Seether will kick off Live Nation’s “Here & Now 2012 Tour” with Nickleback, BUSH and My Darkest Days in Moline, IL on April 10.